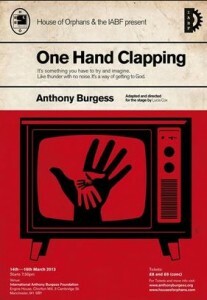 An adaptation of the Anthony Burgess novel of the same name, One Hand Clapping is the story of Janet and Howard Shirley’s marriage in the increasingly consumerist Britain of the 1960s. Or, in Howard’s words, “it is a play about the decay and decadence of the world around us”. At the beginning of the Swinging Sixties, the Shirleys live in a council house and lead an honest, working class life in the North of England. Skilful sound and stage design combined in the production to evoke the era and place. The council housing was subtly set with shabby flowery wallpaper and simple furnishings that suggested the 60s. Snippets of popular music from the time provided the majority of the soundscape and dotted among the tunes were vintage TV advertisements which were shown on each of the four antique television sets that framed the stage. Establishing the narrative tone from the beginning, Janet sat still and looked into the audience. Her face flickered onto the TVs and her voice was heard over-head. Faithful to the novel, Lucia Cox’s intelligent adaptation is narrated relentlessly by Janet. It was a performance that required energy and charm from the actress and Eve Burley brought both in abundance. As Janet, she ploughed through the play inviting the audience along with her. The rest of cast were also solid: Oliver Devoti was suitably strained as Howard and Adam Urey provided much comedy as starving artist, Redvers Glass. Both of their performances sat comfortably with the almost satirical style of the play. Satire was never far away as Janet turned to the audience to advertise one of the many branded products she kept around the house. The absurdity brought a laugh and was strongly reminiscent of The Truman Show. However, there was a sense that this device could have been used with slightly more consistency and purpose throughout the play. With TV life bleeding into the world of the stage, the Shirleys’ honest ambitions and wishes are corrupted by what they see on the box. Comedy is teased out wonderfully in scenes such as Howard’s winning £1,000 on a game show that changes his life. We’d watched this earlier with Howard and Janet on their retro TV set but, in a moment, we were transformed from voyeurs to a live television audience encouraged to applaud Howard’s perfect recital of literary facts. With new found wealth, Howard and Janet set off around the world; Howard in the pursuit of the best that money can buy, Janet content with a cup of tea. 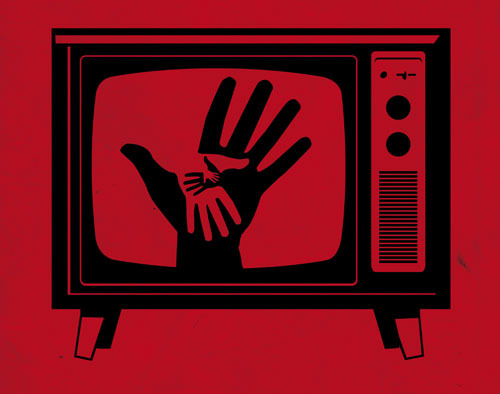 America turned out not to be the America that film and television has portrayed to them and Howard realised that whether rich or poor “life is just one big punishment”. Disappointment overwhelms Howard leading to an attempt at a final premeditated protest against what he perceives to be the sickness of the world and the emptiness of consumerism. It sounds like it should be menacing, but (played perfectly by a straight-faced and logical Howard) it was an utterly bizarre episode. However, the comedy of the writing was somewhat at odds with the direction, which made a little too much of the drama in the scene. A commitment to the comedy of the story would make for a much stronger finish to the play because the absolute absurdity of the story, which had been a prominent element throughout, needs crowning. Thus with slightly more commitment to one style, this could be a real gem. As it is, One Hand Clapping is a charming, ambitious, comic and absurd start to the re:play festival.